Up until a couple of years ago, I had no idea that Teen Titans was a thing. I know plenty about mainstream superheroes and their origin stories, but anything that existed outside of that has failed to reach me in my 35 years on the planet. So when my son who watches Cartoon Network fell in love with Teen Titans Go!, I thought they were capitalizing on a few underutilized characters. Boy was I wrong. Not only does their comic history go way back, but because of a different program that aired on Cartoon Network in the early 2000's, they had a sizeable television presence as well. Simply titled Teen Titans, it was popular enough to spawn a toy line and even video games. Reruns began airing in August of 2017, and it caught my attention. Even so, I never went out of my way to watch it. Every time I caught an episode, I couldn't help but feel as if I should wait until I could watch the series from the beginning, and thanks to this release from the WB Archives Collection, I was finally able to. For the woefully uninitiated (such as I had been), Teen Titans is comprised of Robin, Starfire, Raven, Beast Boy, and Cyborg, working together to keep the people of Jump City safe. They're having a rough go of it in the first season, though, and it isn't hard to see why. There's nothing covert about the way they operate, and if any villains are looking to even the score, all they have to do is look for the big T-shaped building in the middle of the bay. Villains frequently show up to test their mettle against the young heroes, but the most notable this season is Slade. He's especially dangerous because he opts to play chess behind-the-scenes before engaging and has a frightening obsession with Robin. That's enough to deal with, but also, the Teen Titans are sort of their own worst enemy. They're adolescents, so they're coming to grips with life, who they are, and learning how to manage the intricate dynamics of relationships. This comes with frustrations and the occasional spat, which unfortunately manifests into disorganization on the battlefield. Robin tries to keep everyone in check with routine and rigorous training, but Slade makes maintaining that schedule increasingly difficult. I appreciate Teen Titans a great deal because it actually has a structured approach to storytelling. It premiered on Cartoon Network after the success of Dexter's Laboratoy and The Powerpuff Girls, so I can't imagine what kind of pressure there might have been behind-the-scenes to make a bunch of 11-to-12 minute episodes, each a one-off adventure with no discernible placement on the timeline. As a matter of fact, that kind of product is still prevalent on the CN today, with series like The Amazing World of Gumball and especially Teen Titans Go. Instead, Teen Titans went the way of Samurai Jack, with a respectable 13 episode order that appeared in half-hour time slots. It's clear that the show runners cared about making something special. Yes, this show still has some goofy comedy, but things can get real dark, real fast. The heroes fight one-off villains throughout the season, sure, but the prevalent arc (Slade) and character development remains constant, ensuring the season as a whole is cohesive. And speaking of character development, it works because this show didn't need to spend time catering to alternate identities. Most heroes we see in the mainstream are so busy managing double lives that they aren't relatable, so people instead latch on to their ‘cool factor'. But the Teen Titans, at least on this show, don't have to bother. With the exception of Robin, each hero is either who they appear to be on the surface, or their transformation has gated them from their former life. As a result, we get to see what everyone does in their downtime. It's also when we get to see their personalities shine. Robin's confidence casts a shadow of fear at times, Starfire's on the naïve side, Cyborg is kind but gets heated quickly, Raven broods above all else, and Beast Boy is fun, yet sensitive. I found this dynamic comforting. Separated, the Teen Titans are flawed just like everyone else, and outside of the difficulties caused by their age and inexperience, seem comfortable and complete in each other's presence. After all is said and done, Teen Titans is loaded with good natured fun, action, drama, and can even be emotional. That means that not only is it a great show for your kids to watch - as a parent of a 7 year old boy, as much I love the entertainment value of Cartoon Network's usual 11-to-12 minute cartoons, they're destroying attention span - but it's also entertaining for parents and just superhero fans in general. If you're looking for a bit of nostalgia or perhaps something different from typical DC and Marvel-verse fare, check this release from Warner Bros. Archives Collection out! 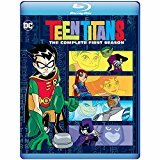 I was expecting Teen Titans - The Complete First Season to be fairly weak. DVD's have been making the rounds since 2006, so I thought this might be a poor upscale loaded with interlace lines. Instead, I was treated to a fairly impressive 1080p widescreen presentation (1.78:1) via the AVC codec. Colors are quite bold and all animation lines are sharp without any hint of edge enhancement. I also didn't see any noticeable interlacing, either. Colors are bold, although the show does adopt a darker tone much of the time. That said, black levels and contrast are quite good, although I think the latter could have been just a tad stronger. The main issue that purists may have with this release is its widescreen presentation. I'll assume that this was originally broadcast in an aspect ratio of 4:3, so there was potential for widescreen framing to lop things off. I haven't seen the show in 4:3, but there wasn't anything that outright offended me. The framing was actually quite good most of the time, with the only issue being that certain shots - and they were few and far between, mind you - looked a little tight, but not overly so. If more seasons of Teen Titans come to Blu-ray courtesy of the Warner Archives Collection, I'm in, because they did a pretty good job here. Teen Titans makes it way to Blu-ray with a serviceable 2.0 DTS-HD Master Audio track. As an animated kids show from '03, I don't think anyone would be surprised to learn that while things sound nice overall, it doesn't really pack a punch. The surrounds are utilized to some effect but the degree is narrow. When things kick into high gear, the action never seems to touch the LFE. Still, dialogue is prioritized nicely and the sound effects and music never drown it out. I also didn't notice any kind of audio clipping or compression anomalies, either. A pretty accurate representation of the source, I'd imagine, just don't go in to this expecting anything crazy. Teen Titans had amassed a great deal of popularity during its run (still not sure how I missed it), and with superhero franchises being all the rage these days, it's easy to understand why the WB Archives Collection would finally opt to release this. It's a quality program that gels humor with action and suspense, all while fleshing out its characters in a way that makes them relatable to audiences of all ages. Certain shows fail to withstand the test of time, but as a newcomer to Teen Titans myself, felt like this show could have been released today and still be just as relevant. Better yet, the video is better than I had imagined. Anyone curious about Teen Titans, it comes highly recommended.